The End of Life Survival Guide | Tips and resources for caregivers of a loved one near the end of life. 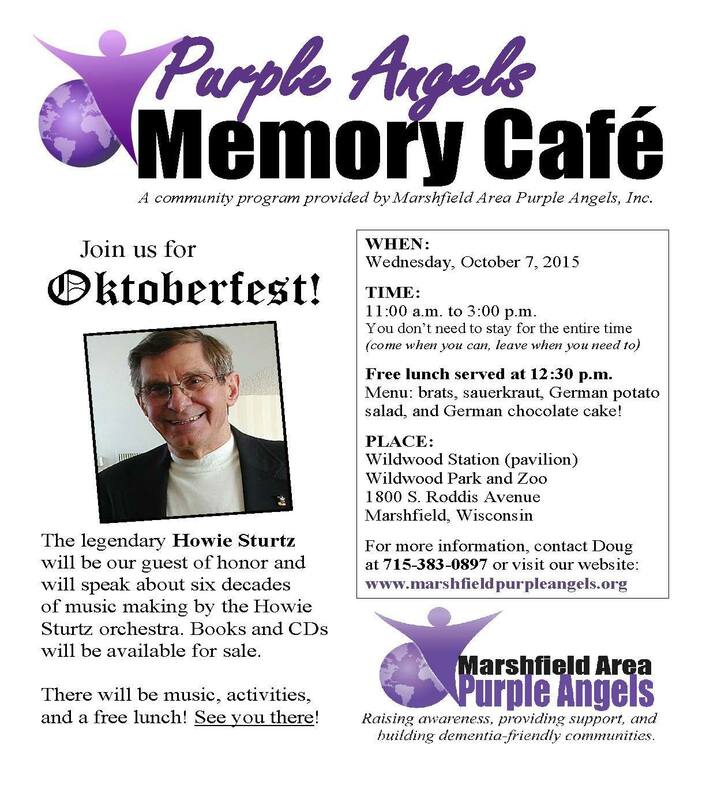 The Marshfield Area Purple Angels are starting to host Memory Cafe events in Marshfield, Wisconsin. The Memory Cafe is a free social event where people with memory loss and those who care about them come together in a safe and engaging environment. Each memory cafe gathering includes interesting and fun activities, food, music, and information about resources available in the community. The main message: You are not on this journey alone. If you know anyone or any family who may benefit by attending the Memory Cafe, please share this information with them. I wrote this story and used it as the introduction to a dementia-friendly business training Marshfield Area Purple Angels did for our local grocery store. Most of us might have difficulty understanding what a trip to the grocery store might be like for a person with Alzheimer’s or another dementia. Ordinary outings that we take for granted can be confusing, intimidating, and debilitating to someone trying to be independent but overwhelmed by simple tasks. Grocery stores can be especially challenging for individuals with dementia because shopping for groceries is a complex task that requires memory for what is needed, what each item is called and where it is located in the store. This story attempts to describe what a trip to the grocery store might be like for someone with dementia. Since you woke up this morning, you’ve already made 1000 challenging decisions: you managed to make yourself breakfast and you figured out how to run the coffee maker. You got yourself dressed. You can’t remember if it is warm or cold outside, so you just put on the clothes that were laid over the chair next to the bed (the same clothes that you had on yesterday but you don’t remember that). Today you will go grocery shopping. You know there are things that you need: bread, milk, you want some Swiss cheese and ham from the deli to make sandwiches for lunch, thinking for a moment that was your husband’s favorite and he will like that. But then you suddenly remember that he is gone and you feel a deep sadness over this loss that keeps renewing itself. Now imagine that you got yourself to the grocery store safely and were able to park the car without any problems. You walk into the store and take a cart and follow the people ahead of you. Things look familiar but there are a lot of people and a lot of noise and its making everything seem confusing in your head. You remember you made a list and begin to look for it. You check your purse, your wallet, your pockets. “Did I even make a list? I am pretty sure I did. Did someone take it?” You see another shopper pushing a cart and reading a shopping list and you think “I bet she took my list. Why would she do that?” but you are too confused and too embarrassed to say anything so you let it go. You walk up and down aisles of cans and boxes that all look the same to you. You look for pictures on the packaging that give you clues about what the items might be. “Did I need spaghetti sauce? I think I need bread. And I want to make sandwiches for lunch.” You remembered that much. You get the bread and put it in your cart next to the spaghetti sauce. You continue looking for other things that you want or need. The store is so big and they keep moving everything around. Nothing is ever in the same place. You turn down another aisle. This looks familiar. You scan the shelf for items you recognize. “Do I need spaghetti sauce?” Another jar goes in your cart. You keep looking for the things you need. It feels like you have been in this store for a long time already. You see people who look familiar. Some say hello, some seem to know your name, but you do not know them. You see a man taking things from a box and putting them on a shelf. “Does he work here? Should I ask him for help? I am not sure if I even need help.” He sees you and smiles and asks if he can help you find anything. “Yes,” you reply… “I’m looking for….for…..oh….I want……holes. You know holes?” … The man frowns and shrugs his shoulders. He doesn’t know that you are looking for Swiss cheese and you can’t understand why you can’t find the right words to tell him what you want. It’s embarrassing and its confusing. Maybe you should just go home. You do remember you need to pay for what you have in your cart. You follow other people ahead of you and watch what they do. Every time you come to this store they change the rules on you. “Did you find everything today?” the lady asks and you nod and tell her you did. And luckily no one stole your purse like the last time you were here. Your checkbook is still there, too, but you need a pen. The lady says you don’t have to fill out the check. That’s good because you don’t remember how to do that and you don’t know the name of this store to write on the check anyway. Your items are bagged for you and you take your loaf of bread and two jars of spaghetti sauce and look for the way out. You see other people leaving and you follow them out to the parking lot where you hope your car is where you left it this time, and that nobody has moved it on you. You know you need to get home soon. Your husband and your two young children are there waiting for you. “Sing Along with Margaret” is a special project that brings meaningful music to people with Alzheimer’s disease and advanced dementia. Music is very powerful, and research shows it is therapeutic: it improves mood, lowers anxiety, reduces depression, and helps people with dementia connect with the present through shared moments of joy. Margaret recorded these songs with her son, Doug, in 2014, just a few months before she passed away at the age of 84. While she had lost almost all her ability to talk, she could still sing! And music became one of the main ways she communicated. 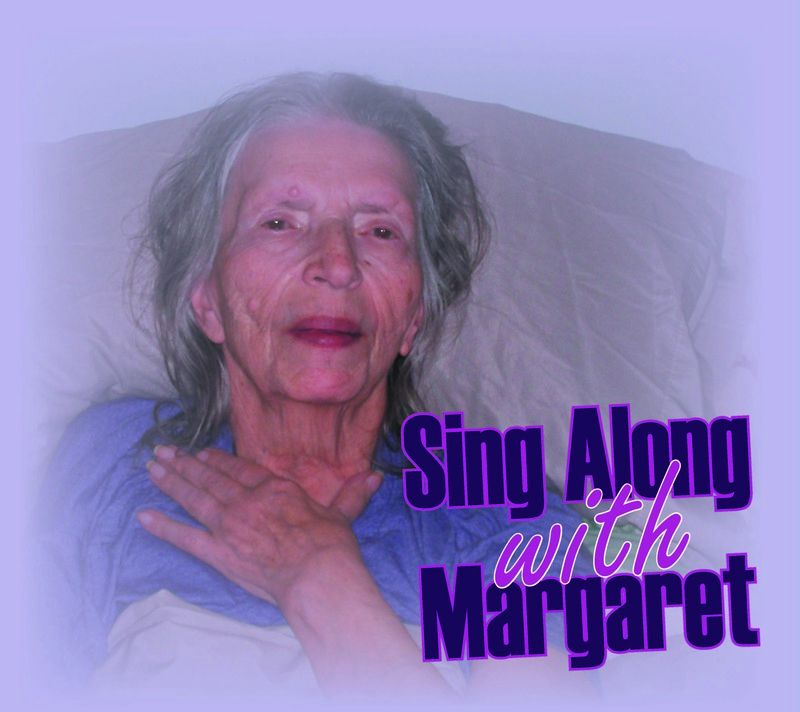 The “Sing Along with Margaret” project is unique because this music is not only for people with dementia and Alzheimer’s disease, it is sung by a special lady who had the disease, and she continues to share her joy with others. I finally finished my project …. 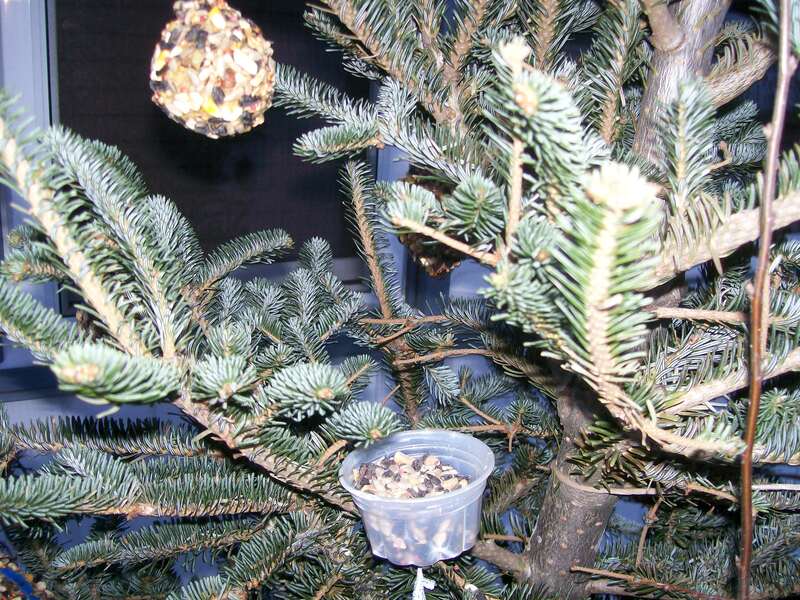 I converted our dead christmas tree into a bird feeder….. I covered styrofoam balls in peanut butter then rolled them in bird seed. I also found some old plastic lids, punched a hole, tied some ribbon through them, and covered them in peanut butter and bird seed, too. and I also found some little plastic cups (I think Mom saved them from when we had those little ice cream cups you eat with the wooden spoons … Mom saved everything!) 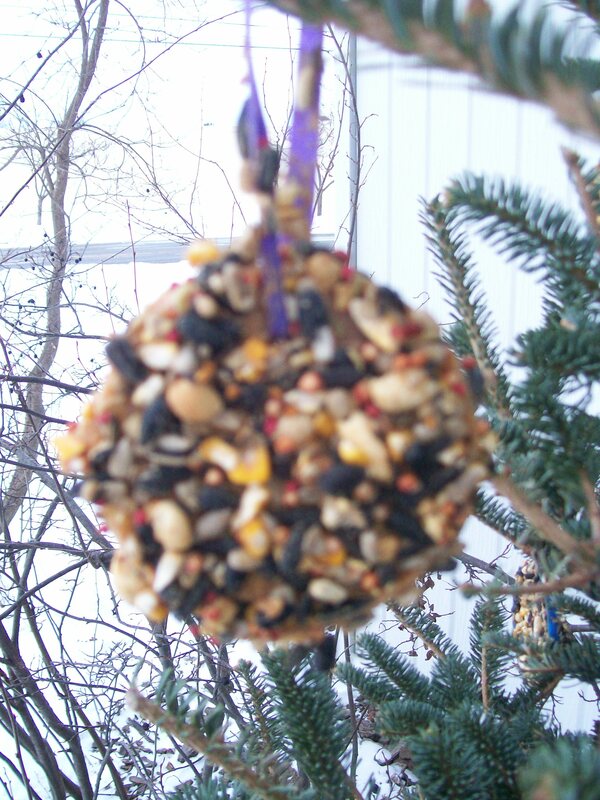 so I wired them on the tree and filled them with bird seed too. Not much snow to anchor the dead tree, so I propped it next to a heart-shaped rod-iron plant holder that is firmly frozen in the ground. 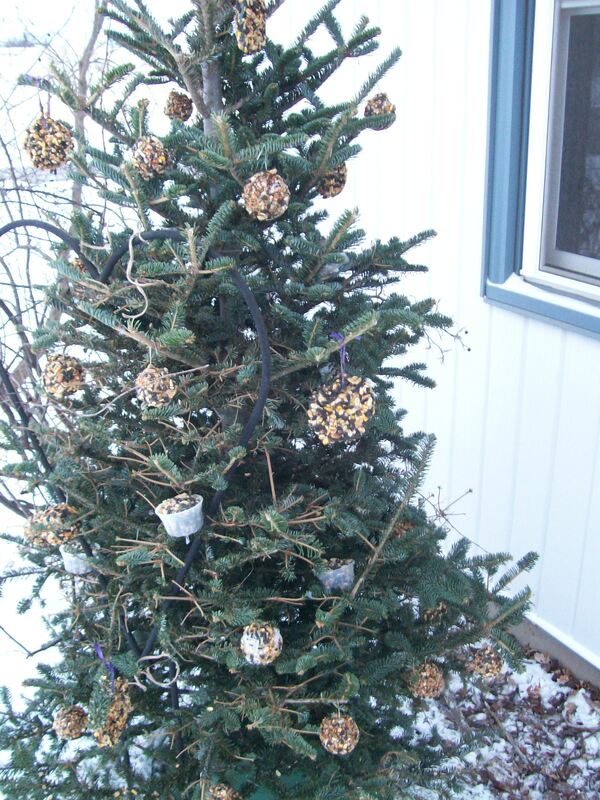 I used some twine to tie the tree to it. I’ll probably feed more squirrels than birds, but I think Mom would have liked this. I have been talking a lot about “music therapy” especially in regards to my role as a full-time, live-in care giver for my mom. I used music every day as part of the care she received at home. I experienced first hand the power music has for people with Alzheimer’s disease and advanced dementia. I’ve read a lot about the topic, including research published not only in the field of music therapy but also research related to activity programs and geriatric care in general, particularly research related to dementia and Alzheimer’s disease. But after getting some guidance and advice from those working in the field of music therapy, and after consulting with staff at the American Music Therapy Association (AMTA), I have decided that I need to make some clear distinctions. Let’s start with the “official” definition of music therapy provided by the AMTA: “Music Therapy is the clinical and evidence-based use of music interventions to accomplish individualized goals within a therapeutic relationship by a credentialed professional who has completed an approved music therapy program.” Understandably, they put heavy emphasis on the concept that true music therapy can only be provided by “a credentialed professional who has completed an approved music therapy program.” I also understand and respect the fact that “music therapy” as a profession is protected, and that the AMTA and other leading organizations in the field have gone through great lengths to develop a credentialing process and standardizing the terminology to distinguish board-certified music therapists (BC-MT). At the same time, however, I respectfully disagree that music therapy can only be delivered by someone with a degree in music therapy and only by those who are board-certified music therapists. I am finishing my Master’s in Public Health and in January 2015 I start on my second master’s degree in organizational management and behavior, so I am well educated. I am also a trained musician and play several instruments and I can sing! I took care of my mother and was her live in, full time caregiver, and I used music as part of her daily therapy. 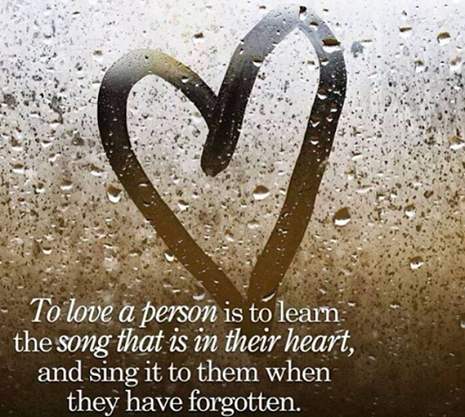 I was able to use music to help my mom communicate when she was no longer able to speak but could still sing. I also used music to improve her behavior when she was sundowning, to calm her so she would be more agreeable and cooperative during bath time, for example, and I used music to help her out of periods when she had hallucinations due to her advanced dementia. The music therapy (and yes it was indeed therapy) that I did with my mom was so effective I was able to get her off of the antipsychotic medication she was prescribed. These are all examples of the therapeutic use of music! My mom passed away December 7, 2014, but I made a promise that I will continue to help others. I have already stated that I plan to continue the “Sing Along with Margaret” project she and I started earlier this year. I am also volunteering my time at local care centers and I am getting involved with the Music & Memory program. But I want to make it perfectly clear from this point forward: I do not have a degree in music therapy and I am not a board certified music therapist. Nonetheless, I still believe in my mind and heart that what I do is indeed “music therapy.” Just for legal protection and to make sure I never unintentionally misrepresent myself and the work I do, I will never refer to myself as a music therapist, board certified or not. I have, however, decided to use the title “Music and Activity Specialist” to distinguish me from someone who just performs music as a social activity in care settings. This title reflects that I have training, education, and experience in developing, providing, and evaluating music and other activity programs designed to benefit people with dementia. So with that said, from this moment on I am going to avoid using the words THERAPY, THERAPEUTIC, or CLINICAL in describing myself and my work as a Music and Activity Specialist. While the microfiber sheets are pretty, soft, and warm, they trap moisture close to the skin and cause skin breakdown, bed sores, and yeast infections. My mom was always cold, especially in the winter months. And they have all of these really thick warm fleece or “microfiber” sheets and blankets and they are SO SOFT! My mom loved them. I bought her different sheets and blankets for her bed. But I noticed last winter when we switched over to the winter bedding, Mom started having problems with her skin. It was breaking down and she was getting yeast infections between her legs and on her backside. One day I accidentally spilled a little water on her blanket and I watched it run and pool but not absorb. That was like a light bulb going on in my head. The sheets and blankets were keeping moisture (sweat, urine, whatever) on the top surface and always against her skin. I went back to all cotton sheets and blankets and the problem went away. So that’s my tip: while the microfiber sheets and blankets are pretty, soft, and warm, if your loved one is not as mobile anymore and spends a lot of time in bed, don’t use them. Use cotton sheets and blankets (100% cotton if you can find them, or at least 60% cotton will be good). There are nice flannel sheets that are warmer, or you can always double up on the regular cotton sheets for extra warmth. Any moisture then will be absorbed into the sheets and blankets and not stay on the top surface as I show in my little video demonstration. First the happy news! — We reached our funding goal!!! Thank you to all who have supported this project. And now the sad news — My mother, Margaret, passed away on Sunday, December 7, 2014. She was not only my mother and my singing partner, she was my best friend and I already miss her so much! 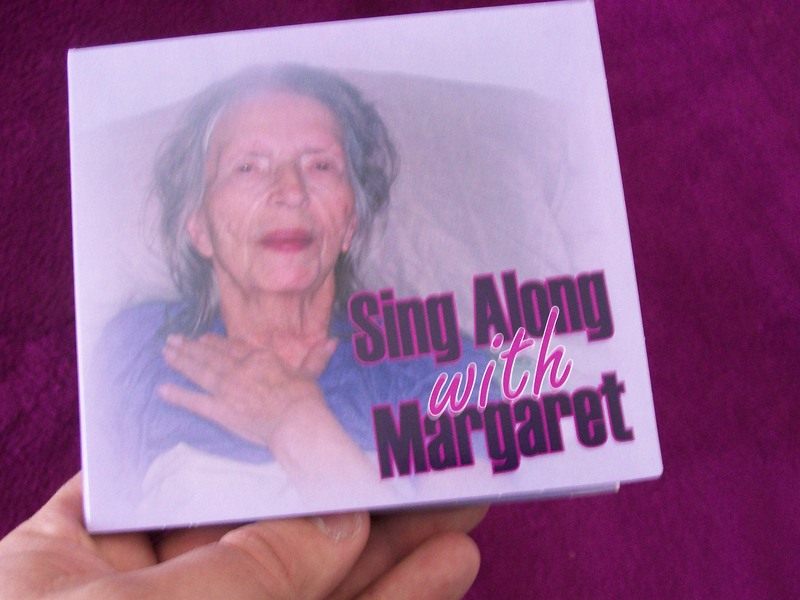 But lets end on more happy news: I fully intend to keep going with the “Sing Along with Margaret” project. Mom and I were able to record several of the songs that are not in the public domain (including “You Are My Sunshine” “I’m Looking Over a Four-Leaf Clover” “When the Red, Red, Robin Comes Bob, Bob, Bobbin’ Along” “Zip-a-dee Do-dah” and “Oh What a Beautiful Morning”). These are the songs where I need to purchase the rights to make them available as free MP3 downloads on our website. This is what your donations are funding! Because of you I will be able to add these songs to our catalog as soon as all the legal copyright stuff is worked out. While I have only just started promoting this project, I already have two care facilities wanting to use the songs Mom and I recorded for people with Alzheimer’s disease and advanced dementia. The local media picked up on my project and they also want to interview me and talk about the project for the local TV news station. I’ve also had a friend of our family offer to make a generous donation that will allow me to expand this project and reach more people and to share Mom’s love of music and the benefits of music for people with Alzheimer’s disease and advanced dementia. Again, thanks to all of you who supported the project Mom and I started that I will now continue in her honor. 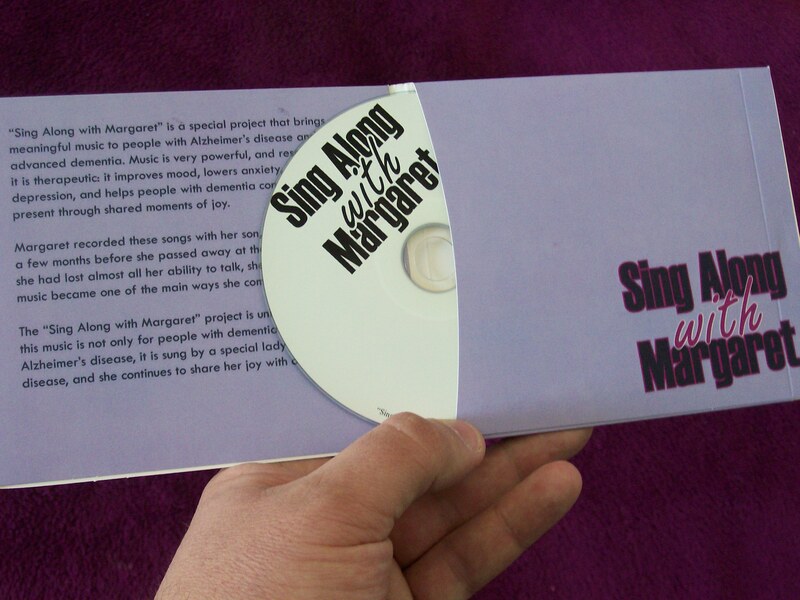 I will likely discontinue using Kickstarter as my way of connecting with you, so please feel free to keep in touch with me instead by email (doug@healthcommunications.org) as well as follow the progress of “Sing Along with Margaret” on our Facebook page (https://www.facebook.com/singalongwithmargaret). And don’t forget that all of our songs are available for FREE at http://www.reverbnation.com/singalongwithmargaret/. Thank you all once again for making this project possible!